His talk wouldn't swish this way and that. And, worst of all, his big jaw wouldn't SNAP." 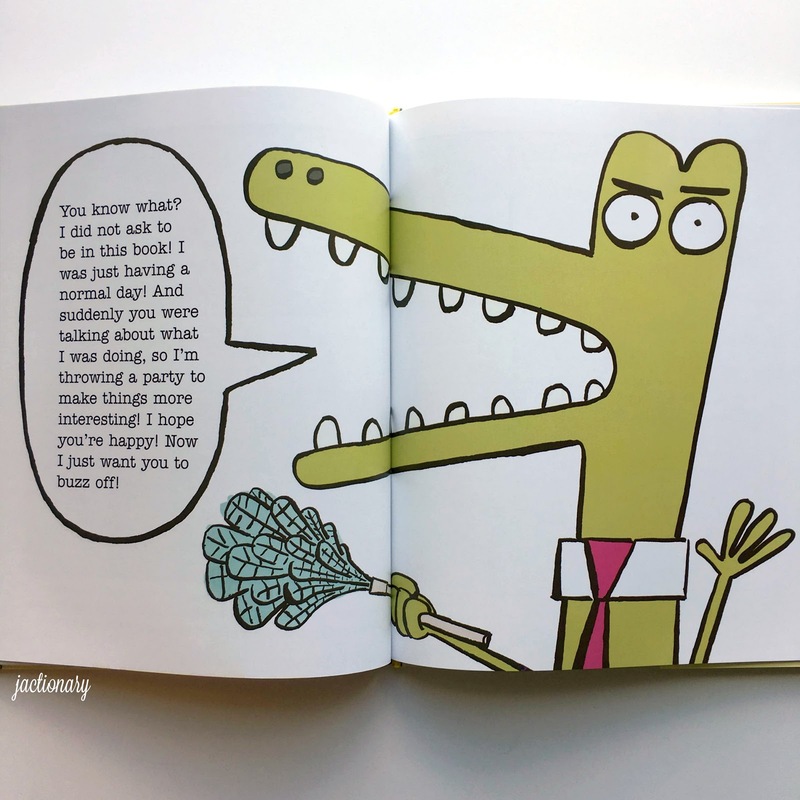 Snappsy the Alligator (Did Not Ask to Be in This Book!) is a new picture book debut from writer Julie Falatko and illustrator Tim Miller. Snappsy is a cute and funny story that begins by following an alligator who's hungry and needs to find some food. 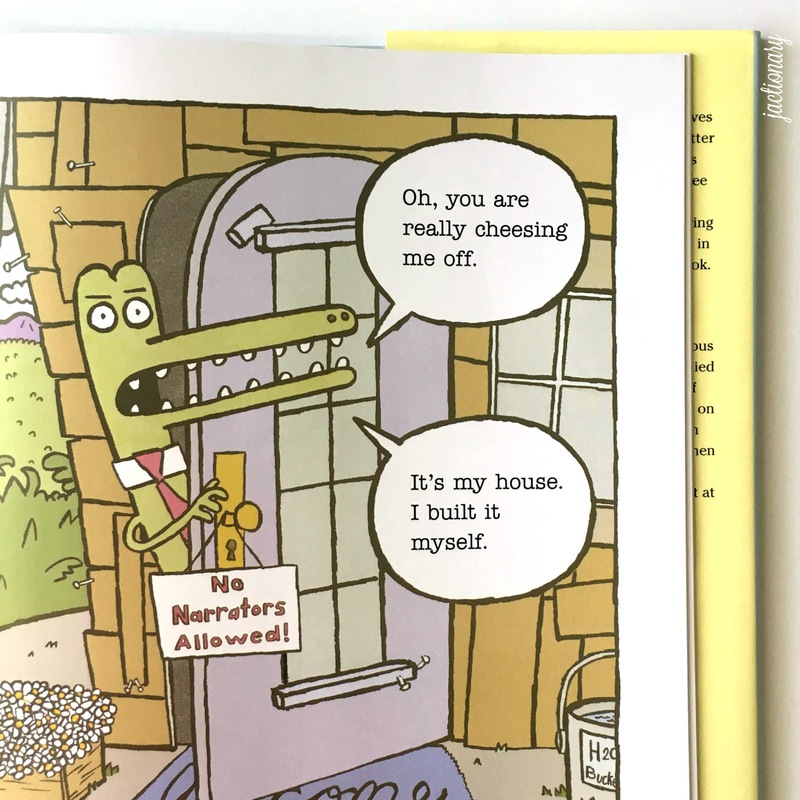 The narrator and Snappsy are at odds with one another, which provides a clever way for readers to interact with the alligator throughout the story: while the narrator keeps describing Snappsy as a violent, cruel, hungry monster, Snappsy tries to show audiences that he's really just a normal guy. The humorous back-and-forth dialogue reminded me of B.J. Novak's best-selling picture book, The Book With No Pictures, in that parents who read the book to their kids can act as the narrator while kids can join Snappsy's side and laugh along at the interplay. While the narrator waits for Snappsy to lure his innocent prey and feast on cute, baby birds and little bunnies, Snappsy is just headed to the grocery story to buy some of his favorite foods, most of which start with the letter P: pickles, pretzels, pears, peanut butter, pita bread, and pasta. When Snappsy arrives home and shuts the door hoping for some privacy, the narrator continues to sit and wait for something to happen. In an effort to appease the narrator (and the audience), Snappsy plans and throws a party and guess who shows up uninvited? The narrator, of course. I thought this picture book was quite funny and while the premise is simple, I chuckled several times. Snappsy is a very likable character, the narrative is clever, and Tim Miller's brightly-colored ink and brush illustrations are very entertaining. I particularly liked how each picture had so much to look at and how there were several jokes hidden within the illustrations for grown-up readers. 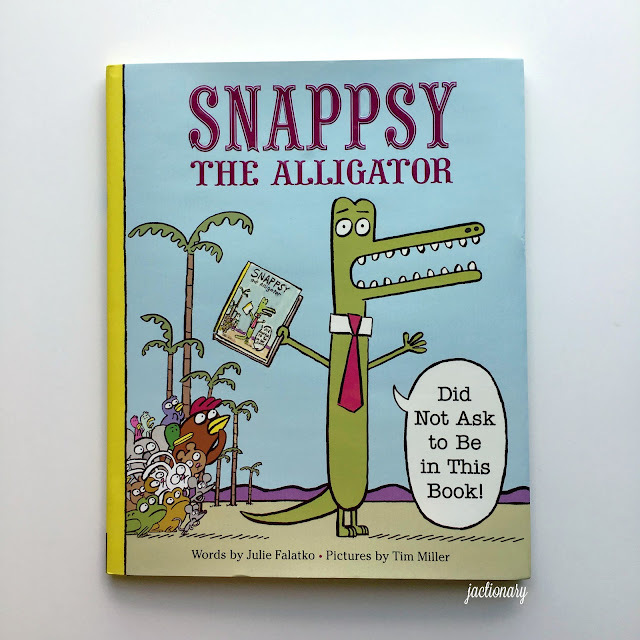 If you're looking for a picture book for pre-school to second grade readers, absolutely check out Snappsy the Alligator (Did Not Ask to Be in This Book!). I look forward to seeing what else Falatko will write and I'm particularly hopeful that Miller's illustrations will appear in numerous additional picture books as he clearly has a knack for entertaining audiences. Thanks for the tips, Julie. I'll be sure to check it out! He's also got a ballet-dancing cow one that comes out in 2017. That'll be great too (and it'll be his debut as an author! ).